Sustainable Development Lab Minsk, 20.11.2018. Laboratory for Sustainable Development. Social Lean Startup Canvas 17.11.2018. Part 1. Laboratory for Sustainable Development. Social Lean Startup Canvas 17.11.2018. Part 2. Second Social Business Forum. Part 1. Second Social Business Forum. Part 2. Biz4all 2018 graduation event. Part 2. Biz4all 2018 graduation event. Part 3. Training biz4all-2 PR, marketing and sales 31.03.2018. Part 2. Training biz4all-2 PR, marketing and sales 31.03.2018. Part 1. Belarusian-German CSO Forum Case-Exchange Weekend 09.10.2017. Part 1.
International Meetup of Social Entrepreneurs 22.11.2017, part 2.
International Meetup of Social Entrepreneurs 22.11.2017, part 1. Biz4all Final 18.11.2017, part 2. Biz4all Final 18.11.2017, part 1. CH training on CSO-LA Call for Proposals in Minsk. 23 January, 2015. Andrei Liankevich, Winner of the photo-competition awarding trip to Brussels. Lecture by Irina Alkhovka "The Role of Advertisement in creating the images of women and men: a mirror or conveyer?" European Intercultural Festival 2013. Day Four. 23 May 2013. Festival´s diary. Day three. Lesson of Jana Kobzova - Policy Fellow at the European Council on Foreign Relations - at the Belarusian State University. 22 May 2013. European Intercultural Festival. Day Three. 22 May 2013. European Intercultural Festival. Day Two. 21 May 2013. European Intercultural Festival Kicks off in Minsk. 20 May 2013. Minsk Region Hosted a Seminar on European Experience on Biogas and the Prospects for Developing the Biogas Sector in Belarus. May 17, 2013. Seminar «Quality Assurance in Higher Education in the EU Countries, Georgia and Kazakhstan» Takes Place in Minsk. 26 March, 2013. Photo-Exhibition ‘Discovering Belarus: Images of Today and Beyond’ by Belarusian Photographer Siarhei Balay Took Place in Brussels. 18 December 2012. Belarusian Transport Experts Learn from Lithuanian Experience. 24-27 September, 2012. Belarusian Experts in Higher Education Study their Georgian Colleagues Experience. 3-6 June, 2012. Belarusian Experts on Transport Issues Share Knowledge with Their Moldovan Colleagues. 9-13 April, 2012. Belarusian Experts in Higher Education Visited Brussels. 19-21 March 2012. A Team of School Pupils from Brest, the Winners of the National Competition 'What Do I Know About Europe? ', Arrive in Brussels on Invitation of the ODB. 08 November 2011. Conference "Transforming Belarus: Ways Ahead" Took Place in Brussels. 7 November, 2011. Seminar “Transfer of Macedonia NGOs Experience on Visa Liberalization” Takes Place in Belarus. 27 August 2011. Contemporary Art Exhibition “Search for Roots” Opens in Brussels. 3–7 February 2011. Round-Table 'Belarus after the Election: Revolution, Reform, or Stagnation?' Takes Place in Brussels. 24 November 2010. Seminar “Interaction between Labour Market and Education in Belarus” Takes Place in Minsk. 24 June 2010. EU Environmental Policy: Sharing Knowledge with Belarus. Seventh Visit of Belarusian Experts to Brussels. March 15-18, 2010. Round Table Discussion on EU and Belarus Transport Policy Takes Place in Minsk. 4 February, 2010. Round table on Cooperation between Belarus and EU in the Field of Higher Education Takes Place in Minsk. 6 February, 2010. EU Policy: Sharing Knowledge with Belarus. Sixth Visit of Belarusian Experts to Brussels. February 1-5, 2010. Belarusian Experts on Science and Education Visit Brussels. 14-17 December, 2009. EU Policy: Sharing Knowledge with Belarus. Fourth Visit of Belarusian Experts to Brussels. November 23-27, 2009. Discussion on "Simplification of the Visa Regime between the EU and Belarus: How to Break the Vicious Circle?" Held in Minsk. 29 May, 2009. Conference on the Role of Civil Society Groups and Local Authorities in Promotion of More Equitable, Open and Democratic Society. May 25-27, 2009. 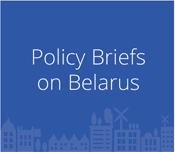 EU Policy: Sharing Knowledge with Belarus. Second Visit of Belarusian Experts to Brussels. March 29 – April 2, 2009. 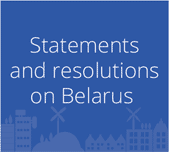 EU and Belarus Six Months After: Achievements and Challenges Ahead. 4 March 2009. Round-table “The Recent Policy Swift in Belarus-EU Relations: Probation Period for Lukashenka” in Brussels. 26 November 2008. Launch of the project "EU policy: Sharing knowledge with Belarus". First visit of Belarusian experts. 3-7 November, 2008. Campaigning for Cheaper Visas for Belarusians. 18-21 February 2008. “Spark of Bravery” in Brussels, 8 November 2007. Documentary on Forced Disappearances, Screening in Brussels. 24 October 2007. Belarusian Christian Democrats and Greens Visiting Brussels. 12-14 June 2007. Study Visit of Belarusian Experts to Brussels. Day 2.